Tom Anderson has joined Doncaster Rovers on a permanent deal. Doncaster Rovers have signed Burnley centre back Tom Anderson on a two-year deal. The 24-year-old impressed on loan at Rovers following his temporary switch in January. And with Anderson’s contract at his hometown club due to expire this summer, Darren Ferguson has wasted no time at all in making the no-nonsense defender his first signing of the transfer window. Anderson missed two months with a fractured cheekbone, which he suffered at Rotherham in late February. But he made his significant presence felt in seven appearances for Rovers and his safety first approach helped the team. 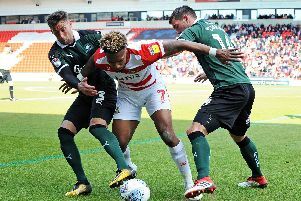 Ferguson revealed his intention to make the move permanent in early April and, following the conclusion of the season, Doncaster have acted quickly to get their man. “I’m really happy to get the deal done quickly, it means I can now relax with my future sorted and get ready for the start of pre-season,” said Anderson. Meanwhile, Luke McCullough has been named in the Northern Ireland squad for friendlies with Panama and Costa Rica.